One of the pleasures of parenthood is the opportunity to play with toys again. And when the toys themselves are filled with memories of ones own childhood, the experience is both generative and reflective. This past holiday season, we got my son Leo a set of tinker toys, and though they are a little different from the set my brother and I had as kids, they are pretty much the same toys. Leo is a builder (blocks, legos, pillows, you name it) and we have already made a couple of significant tinker toy structures together. Its hard not to let my own enjoyment eclipse his, but hopefully my excitement at getting a chance to tinker is received with more than a sense of competition. Not coincidentally, I have also recently itched a long-standing urge to learn how to play GO, something I have always thought of as a very adult kind of game (doesn’t everyone picture old, wizened people playing GO?). I picked up the rules of the game fairly easily, but am really struggling with my inability to think strategically. I have lost so many times to the computer that is my iPhone that I am just about to give up. I am frustrated that I can’t seem to find the pleasure in thinking through the strategy of the game. I also downloaded an app that is a generation removed from the old tile puzzles that I am sure litter coffee tables at grandma’s house across the world. 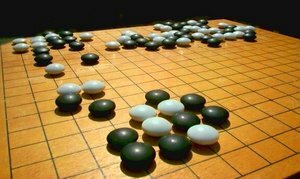 Where I have been frustrated with GO, I am completely engrossed in the never-ending puzzle combinations and more rewarding (and quicker to come by) victories. I just assume everyone’s mind works a little differently and has settled into solving problems or answering questions through a series of calculated steps that are just right for that person. I know that I am more creative and productive when I have all the pieces of a puzzle laid out before me, when I can move them around, trying different combinations at will and quickly (and with little strategic organization) so that eventually, I will find the solution. But I can’t just imagine how things will look when I make a move, I have to try it. I have to see what it looks like and only then will I be able to process the information necessary to find the creative solution. I am a tinkerer. Always was, always will be.